Vtg Elaine Gold Silk Scarf Floral Ribbon Accent Shawl Wrap Red 34.5" x 35"
Elaine Goldi Red Ivory Green Floral Silk Hand Rolled Scarf Shawl Wrap 21" x 21"
Designer Elaine Gold Collection XIIX Long Silk Scarf 10"x51"
Elaine Gold WHITE IVORY MULTICOLOR BUTTERFLY 100%SILK CHIFFON SCARF WRAP 11"x54"
God Bless America Patchwork Scarf Elaine Gold for Collection XIIX 20" x 20"
Elaine Gold Scarf Necktie 100% Silk Black White Textured 2000 Millennium 21"x21"
ELAINE GOLD - ABSTRACT PATTERNED - 31" SQUARE - SHEER SCARF! 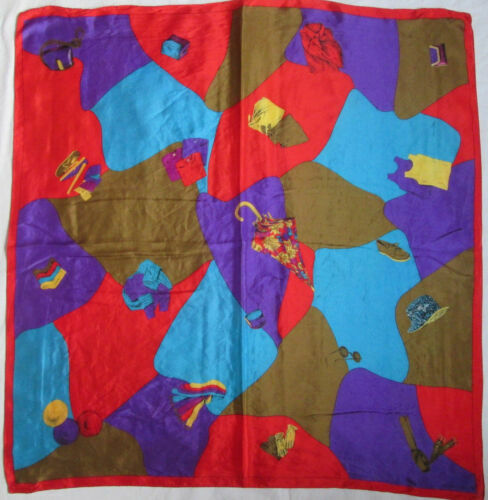 VTG Elaine Gold Collection XIIX Black Gold Emblem Striped Square 34"
ELAINE GOLD blue gold and red classic leaf design Polyester Scarf 46" x 46"
Elaine Gold Scarf Collection XIIX - MUSIC Theme - red, black & white 35" x 35"
Elaine Gold Bright Aqua Teal Lotus Flowers Oversized Cotton Scarf 35" Sq. Elaine Gold Black Retro Goth Lacey Fringed Stole Scarf 42" X 41"